The 16' articulated ladder is designed for a variety of one man and two man jobs. 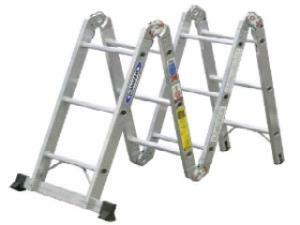 It can be used as a double stepladder, stepladder, stairwell ladder, straight ladder, and self-supporting scaffold. There are 3 sets of hinge locks, every four feet of ladder, that allow for 18 possible ladder positions. The unit is designed to support up to 300 lbs. * Please call us for any questions on our ladder 16 foot articulated rentals in Hillsdale and Ridgewood NJ.